The Slade Research Centre in Woburn Square hosts collaborations and events that involve researchers from many different fields from the Slade and UCL, as well as from the wider community, national and international. One of the aims of the Slade Research Centre is to encourage and teach students to create artworks of the highest quality, to help them develop and achieve their ambitions as artists, and in so doing to engage in artistic research at the highest level. 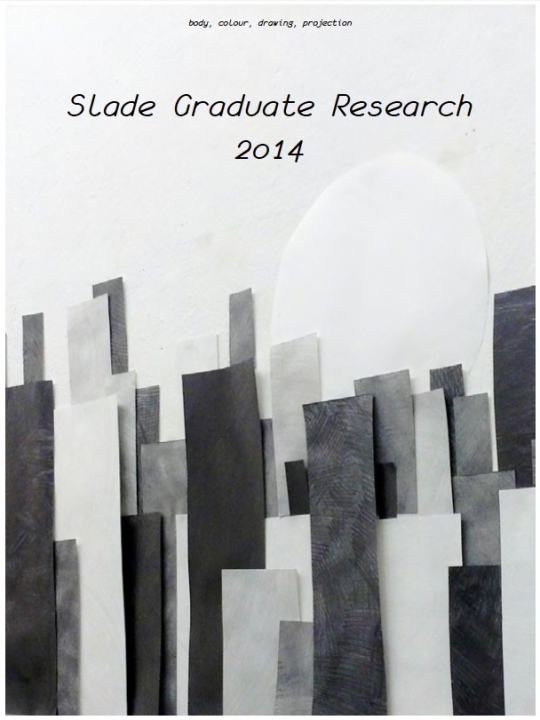 The Slade Research Centre is used by all our programmes, including undergraduate, graduate and doctorate. The continual conversation of Fine Art with design, architecture, fashion, and the development of culture and its related industries is often overlooked. Much of what we see around us has been made by someone who went to art school, often working with experts in other fields. The Slade Research Centre and Graduate Research Weeks support emerging artists in providing a forum to help construct the thinking and making which will allow them to engage positively with other disciplines. In light of exploring the constant themes that run through artistic practice, related questions and ideas shift and change. Context and materials change too, and through this dynamic, artists bring new questions and answers to the fore, interrogating familiar issues in new and different ways, and fostering innovative research. This e-book represents a selection of the work of MFA and MA students who participated in one or more of this year’s Graduate Research Weeks. It demonstrates a range of experimentation, collaboration and discussion, and reflects the spirit of ambition and enthusiasm that has energised the programme. We would like to thank everyone involved, the students and staff within the Slade and UCL, as well as the artists and researchers from outside the university who have engaged in our debates and given so generously of their time and expertise to help us achieve our aims. Special thanks goes to Professor Chris Dean and Dr. Wendy Birch, UCL Anatomy for their generous support in hosting Anatomical Drawing for Slade students in conjunction with “Body Week”.